What Is The Peace Or Fellowship Offering In The Bible? 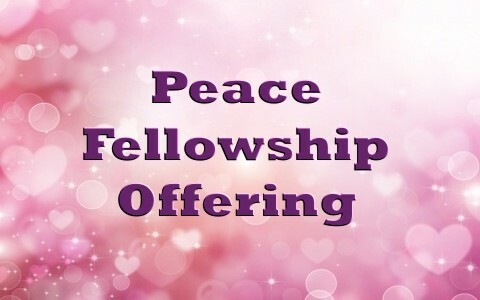 In the Bible the peace or fellowship offering is mentioned. What is it? Should Christians be offering it today? What the Bible describes and means as the obligatory offerings is that the people are obligated to make. These offerings always reflected and pointed to the Perfect Offering that would come hundreds of years later when Jesus Christ made Himself a once-and-for-all offering for the sins of those who are unworthy. This offering was an offering of His own life given for those who would repent (Mark 1:16) and believe in Jesus Christ as their Savior (John 3:16-17; 36). Every offering required a blood sacrifice and Jesus’ own blood was the only sacrifice that took sins away. All of the other offerings were perpetually given day after day (Ex 29:38; Heb 10:11) but Jesus’ own offering only had to be made once (Heb 10:10) to make us righteous before God’s sight (2 Cor 5:21). Even the Old Testament prophets wrote about Him that someday we “shall be redeemed without money” (Isaiah 52:3) and that “the Lord’s hand is not shortened, that it cannot save, or his ear dull, that it cannot hear” (Isaiah 59:1). He is worthy of our offering of thanksgiving. The Day of Atonement which is called by the Jews “Yom Kippur” or the “Day” (yom) “Kippur” (to atone) looked ahead and prefigured the atonement that would be Jesus dying for unworthy sinners who could not ever redeem themselves (Eph 2:8-9) or close the separation from God that our sins had created, causing God to hide His face from us (Isaiah 59:2). Yom Kippur is probably the most important day of the year to the Jews. It is a holy day where no work is to be done, at least by orthodox Jews. It is a day of fasting or afflicting of one’s self. The observance of this day was a command for the Israelites in Leviticus 23:26-28 “It shall be for you a time of holy convocation, and you shall afflict yourselves and present a food offering to the Lord. And you shall not do any work on that very day, for it is a Day of Atonement, to make atonement for you before the Lord your God.” The Hebrew word used for “afflict” is generally understood to include fasting and meant to “oppress, humble, be bowed down” and even “to become low, to be downcast” before the Lord. There were serious implications for anyone who didn’t observe this law; “For whoever is not afflicted on that very day shall be cut off from his people. And whoever does any work on that very day, that person I will destroy from among his people” (Lev 23:29-30). Today, for anyone who refused to humble themselves and trust in the Lamb of God, they too will be cut off from God’s people but this will be for all time (Rev 20:12-15). This is what is called obligatory or compulsory. The observance of this day and the offering made on this day had to do with sin…but not so with the Peace or Fellowship Offering. The Peace or Fellowship Offering was the only offering that was totally a free will offering. Can you imagine God commanding someone to give thanks? That would seem to defeat the purpose and intent of it wouldn’t it? If someone were commanded to give thanks then it wouldn’t seem genuine or sincere so this is why it is the only major offering that is given by a person’s own voluntary choice. Today we see that we who have been born again have peace with God (Rom 5:1) and this peace came at the most costly of prices (John 3:16). His body was bruised, battered, and pierced for our transgressions (sins) as we read in Isaiah 52:13 – 53:12. He took what we deserved and paid what we owed but it was a debt we couldn’t pay and only He, that is Jesus, could. This offering by Christ enabled us to have peace with God and have fellowship with Him and you cannot have fellowship with someone until you first have made peace with them. Today we can still give this offering but not out of compulsion or obligation. We should want to offer God thanks for all He has done for us, His children. That’s why Paul wrote that we should be “giving thanks to the Father, who has qualified you to share in the inheritance of the saints in light” (Col 1:12) because “He has delivered us from the domain of darkness and transferred us to the kingdom of his beloved Son, in whom we have redemption, the forgiveness of sins” (Col 1:13-14). Our lives should reflect a holy gratitude to God to live lives that are holy and pleasing to God which is why Paul wrote “Let there be no filthiness nor foolish talk nor crude joking, which are out of place, but instead let there be thanksgiving” (Eph 5:4). So I say to you and to me, through Paul, “whatever you do, in word or deed, do everything in the name of the Lord Jesus, giving thanks to God the Father through him” (Col 3:17). Want to know what the will of God is? Here it is: “give thanks in all circumstances; for this is the will of God in Christ Jesus for you” (1 Thess 5:18). Give thanks to God. He is worthy of our offering of thanksgiving. That’s because we have been redeemed “with the precious blood of Christ, like that of a lamb without blemish or spot” (1 Pet 1:19). How can we not be thankful and freely offer and give thanks because we have peace with God and fellowship with Him but only because of Jesus Christ’s own life. That is worth giving thanks for both today and someday, for all eternity. I am joyful that God uses you to answer some of my questions. It is strange since you wrote this on the 17 and I did not read this until today. And nestled in one paragraph was “Want to know what the will of God is? Here it is: ‘give thanks in all circumstances; for this is the will of God in Christ Jesus for you’ (1 Thess 5:18).” Imagined that! I have been searching for a couple of days this subject and today I see this article. Everything in due season, right? Most of the time, my sinful nature takes over and bubbles over, and I wish God would take away my freewill. I do not want to say this, but in my case, it is difficult to be obedient to God and his Word and not sin. I want the Lord to be in control of my life and yet I do not know how to let Him take over completely. Thank you for your kind words Carmen. I am with you on the sinful nature but look at how Paul still struggled mightily in Romans 7. I want to let Him take over too but the good news is that there is the struggle with sin and that is promoted by the Spirit of God. If there were no struggle, then I would be worried. That you are in a fight for obedience is evidence that you love God and desire to obey Him. Take heart, God will never give up on us.